What Outside the Box thoughts could Mark Zuckerberg possibly be entertaining? After all, other companies have gone public in the past, other entrepreneurs have created business breakthroughs, even social movements, changing for ever our way of life… All of it has been done! What could actually become a nearly impossible, farfetched, paradigm shifting unprecedented move for Mark, for Facebook and maybe for humanity? What could be Mark’s Out the Box Thought? In light of such disappointing IPO performance, Mark should have thought of alternatives. If Facebook were a nation, it would be the third largest by population behind China and India. What would happen if instead of going public, Facebook purchased a small island territory to found a new nation with its own currency. The Facebook company would change its fiscal address to that new self-made nation. Then, invest their cash reserves on energy producing infrastructure (a source says the company is on track to earn $2 billion before taxes) and issue the Facebook Dollar as an energy backed currency that could be used by any of its “citizens” to buy and sell goods and services world wide. Funding to keep expanding the Nation would come from sales taxes levied to its citizens, and not from selling their stock. 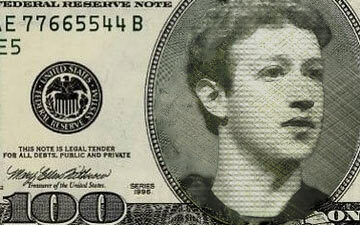 When you buy Facebook Dollars, you would be effectively exchanging US Dollars for energy backed FB Dollars whose value would fluctuate as any other currency in the market. The new nation would have 500 million virtual citizens from every nation of the world becoming a nearly frictionless market where physical borders would not be an issue, effectively rendering the traditional concept of nation obsolete. I bet John Lennon, one of humanity’s best “out the box thinkers” would love this one! What do you think about this? Contribute your out the box thoughts in the comment section! Key Takeaways: This question is designed as an exercise to explore an Out the Box thought. These sorts of thoughts allow you to stretch your mind-soul to fathom farfetched unprecedented events or situations. These thoughts drive renewal and keep your child within vibrant and able to create or adapt to change. Imagining what Out the Box thoughts could a person like Mark Zuckerberg (or any other person for that matter) be entertaining has the added benefit of exploring other people´s worldviews. Paradigm shifts and in general the advancement of humanity has been driven by people brave enough to make these thoughts reality. excellent suggestion, and direction …hey World, let’s go borderless!!! thanks Javier. well played. My Mind is Open/Expanding, and operating ‘Outside’ due to this post/idea. Yes! it is not so much about the likelyhood or desirability of having Facebook as a Nation, it is more about allowing our mind-soul to entertain these sorts of unprecedented situations as Outside-the-Box thought. Specially, as an example of true farfetched vision that no one would consider possible. That is the type mind bending exercises that keep us young. As a matter of fact, if you talk to children about these ideas, you will find that they will consider them within reason. In the years to come, we have to be divorced from reason since most of the stuff that will happen will have to be Outside the Box.